Founded in November 2012, Chaayos is a venture by Nitin Saluja and Raghav Verma, addressing the innate need of Indians for a hygienic, made-to-taste cup of chai, beyond the comfort of their homes. Chaayos now has 50+ cafes across Delhi-NCR, Chandigarh, and Mumbai, having added 20 cafes in the last 18 months. 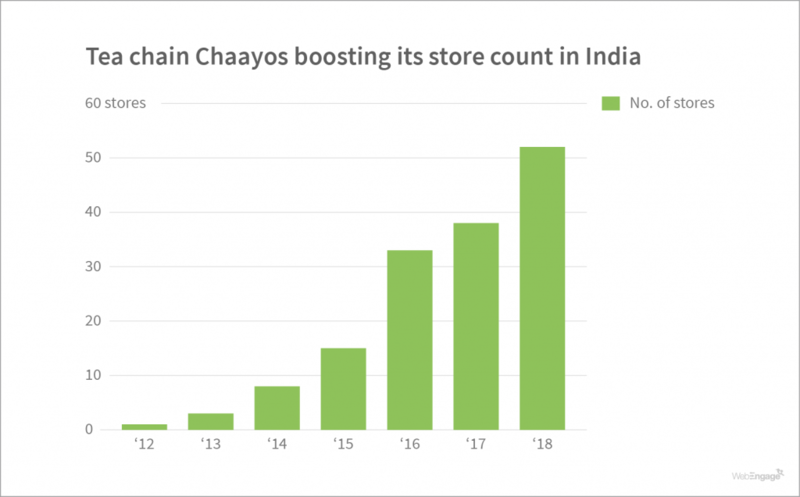 With an 80:20 split between offline transactions in the form of dine-ins and takeaways, and online orders through their web-app and website, Chaayos currently sells over 500k cups of tea every month. They are betting big on their offline business and target to triple their sales within the next 18 months. To keep up with the targets and reach out to all chai lovers, Chaayos charted out a plan to open several cafes across the country. While the plan was in place, they also wanted to invest in their existing customers. They were driven by the belief that returning customers resulted in higher ROI as compared to new customers. So, when Chaayos decided that customer retention was the way to go, they were confronted with three major challenges. Of all the users who placed an order for the first time, ~44% of them returned to place an order again. This kind of user behavior is commonly referred to as repeat purchases in marketing parlance and is tracked as repeat purchase rate, repeat customer rate, reorder rate, or even customer retention rate. How often customers were purchasing from Chaayos in a given period of time. Evaluating the two metrics will give Chaayos more context about their customer’s purchasing habits which will be instrumental in improving stickiness. 1. Loss of revenue and hard work that was put into acquiring the user. 2. And a loss of opportunity to nurture the relationship over time. Streamlining their efforts on getting the lost customers back was going to help Chaayos save quite a lot of time, money and effort. Chaayos understood that customer feedback is one of the most reliable sources for tangible data that can be used in making future business decisions. Collecting feedback was easy, but translating it into actionable takeaways was a challenge. For instance, mapping customer feedback from their retail cafes wasn’t as seamless. This was a hurdle in getting meaningful insights into about their staff’s performance. To overcome the challenges discussed above, the team at Chaayos decided to organize their entire customer base data. 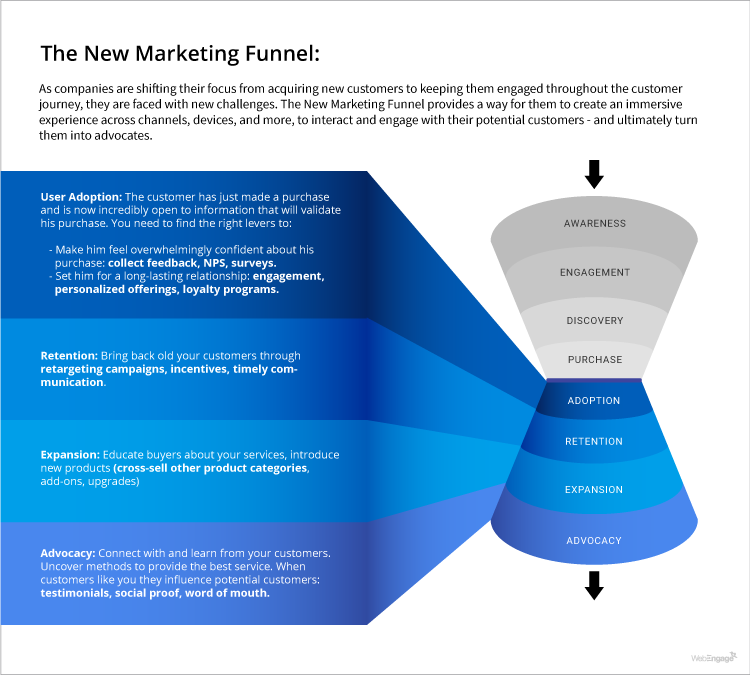 This would help them understand their customers better and execute their retention plans accordingly. For a retail business like Chaayos, a POS (Point of Sale) system records and collects all sales transactions and associated customer data. Such large data sets are a treasure trove but are not malleable into anything concrete until retailers bring in powerful analytics which can process the data into meaningful insights. 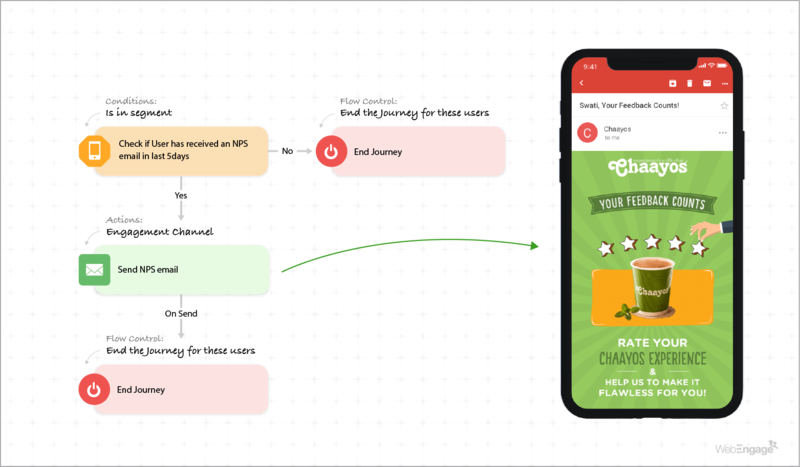 Using the WebEngage Journey Designer, Chaayos executed omni-channel engagement workflows to address their retention problems. Let’s walk you through all the journeys they created to overcome each challenge. A Loyalty (LoyalTea) program was introduced to reward customers for every interaction with Chaayos cafes. A journey was created specifically to promote the loyalty programme to the users. The journey is triggered every time a user places an order at the cafe (for dine-in or takeaway). Whenever the user places his next order, the journey checks if the new order was placed in the cafe or not. If the condition is true, the user is exited from the journey (no communication is sent to him). However, if the condition is false, the user proceeds ahead. 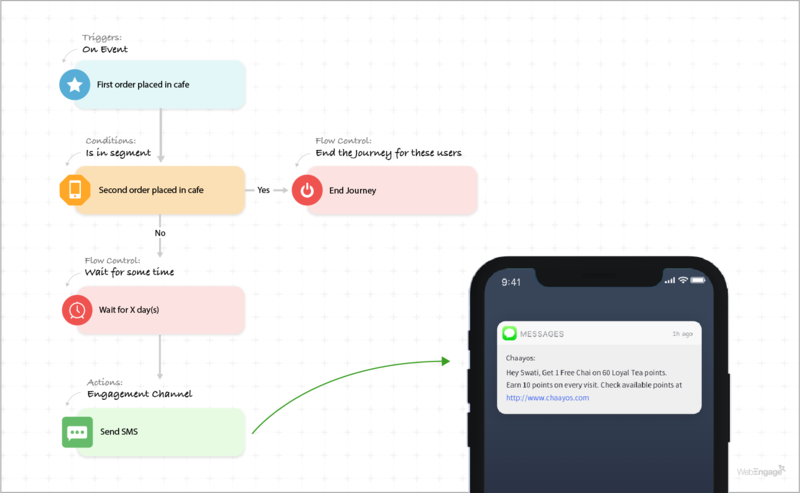 The journey waits for a day (remember that drinking tea in a daily habit) and an SMS is triggered that incentivizes user’s next visit. Subsequent messages were sent to the user, each time with different content. Journey Designer empowered Chaayos to drive engagement across their user’s lifecycle with personalized content. The message on the left introduced users to new menu items, while the one on the right was custom-made for gift card users. Every time a user placed an order at the cafe, the journey would add an extra wait time before sending the next message. This way the message felt timely and personalized. The journey was created in May and after three months of run-time, it showed a conversion rate of 38%-39% in July. This means that in the month of July, 38%-39% of their customers (that were targeted by this journey) placed repeat orders in the cafes after receiving a message from Chaayos. Now, one might argue that these customers may have converted organically i.e. without being nudged by the journey. Well, the answer lies in data. Of all the users who were eligible to receive the SMS, a fraction (10%) of them were not sent any message (this group of users is called a Control Group. They entered the journey, but bypassed all the steps of communication, which means that they did not receive any external nudge from Chaayos). We then compare the conversion numbers of the two groups: those who were engaged by this campaign (i.e., received a message from this journey) and those who were not (the Control Group). In the screenshot above, you can see that the overall conversion of the journey is 38 – 39% whereas the conversion for the Control Group (CG) alone is in the range of 9-10% i.e. 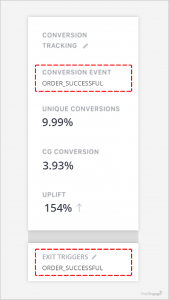 without any external nudge, only 9-10% of users came for a repeat order. Through this journey, Chaayos was able to increase their purchases by ~301% for the users who were engaged by the journey. This shows that the journey had a tremendously positive impact on their top-line. Here’s a comparison between users who were sent a communication (non-CG) V/S users who were not sent a message (CG). 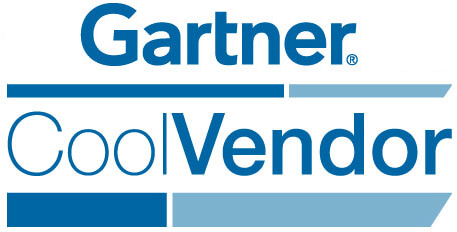 Conversion numbers for users nudged by the journey grow faster than the control group users. They say that even if your loyalty program snags you just one or two regular customers, then it would have practically paid for itself already. 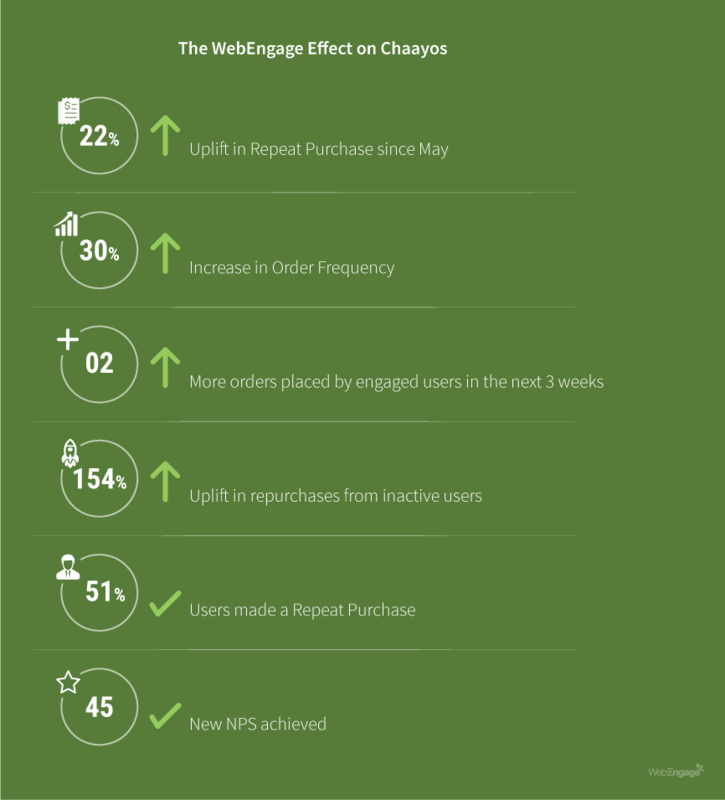 Chaayos experienced an uplift of 30% in their order frequency; customers who were engaged via this journey placed at least 2 more orders within the next 3 weeks. 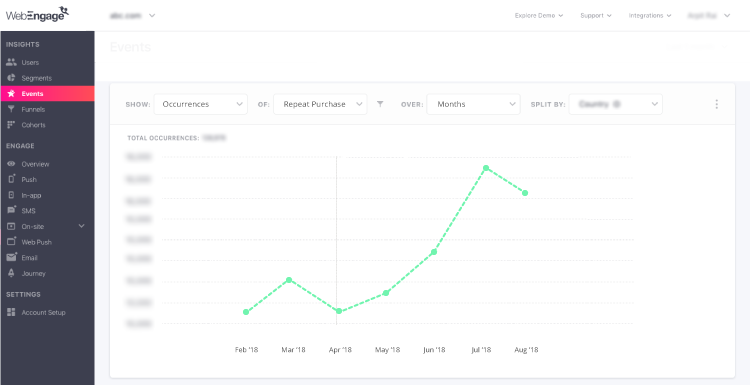 So far, Chaayos has enrolled 95% of their customers in their ‘LoyalTea’ programme, which has been consistently winning them repeat purchasers. The above graph shows the MoM trend in overall repeat orders since May. There was an overall 20-22% uplift in repeat orders since they started using WebEngage. Through the loyalty programme, the company was also able to understand its customers’ preferences for different occasions and suggest the right product for campaigns to be executed later. We’ve analyzed this journey below. The journey gets triggered when a user is identified as an ‘Inactive User’. Once identified, the user is sent the first piece of communication: a ‘we missed you’ message with an introduction to popular menu items. After a few days, they receive another message, prompting them to place an order. As soon as the user places their next order, they are removed from the journey. Winback journey performance. 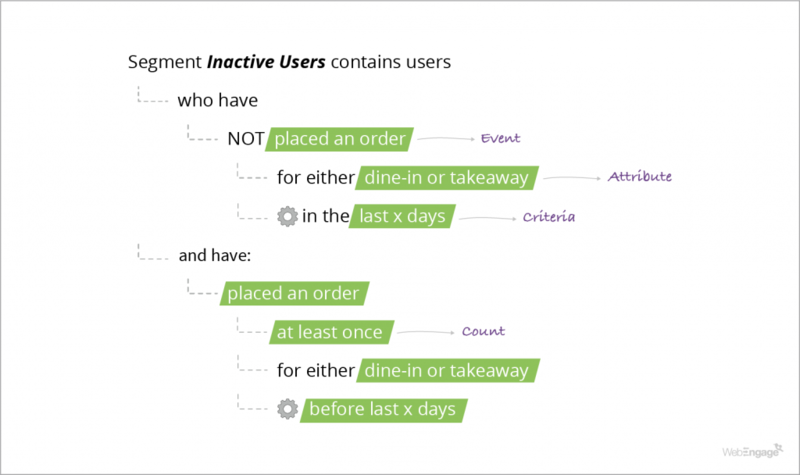 A conversion is considered when an inactive user places an order. The CG for this journey recorded a conversion rate of merely 3.93%. This means that had this journey not been running, Chaayos would have converted only one-third of their inactive users. This was a 154% uplift in inactive user retention. Chaayos created their third journey to garner user feedback and rating. These ratings were then used to calculate the NPS (Net Promoter Score) and derive actionable insights into what was working well and what should be done to make the customer experience better. Here, we have analyzed the journey that Chaayos created to collect user feedback. NPS: Their NPS hovered around 45, which is close to ‘Excellent’ (you can read more about NPS here). Triggered approach: Chaayos got rid of old-fashioned blast emails and adopted a sharper, contextual approach to collect user feedback. The feedback survey was now sent to a user only after they placed an order. This triggered approach increased chances of getting a response by making the customer feel like the email was sent exclusively to them. Post-purchase feedbacks also make users feel overwhelmingly confident about their purchase. In the long-term, it helps user retention. Checked user’s reachability: Based on the customer’s reachability, the feedback email was sent via email or SMS. Refrained from overkill: Users who had filled out a survey via email or SMS over the last 5 days were excluded from the message. Evaluated the staff’s performance: By linking each feedback to their cafe’s name, Chaayos made NPS one of the key performance metrics for their staff. Identified their strengths: Detailed feedback gave Chaayos insights into what was creating a positive customer experience. 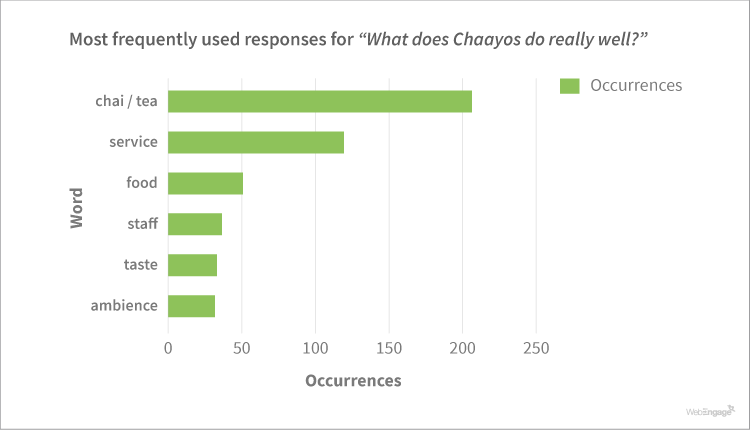 We analyzed 1,000 most recent responses to “What does Chaayos do really well?”. The most frequently used words have been charted above. Worked on their weaknesses: Chaayos took negative feedback as a learning opportunity. They would reach out to the users over the phone to get a detailed feedback. This not only gave them insights about their service but also provided them with a chance to bring users back and improve their perception of the brand. Used NPS as a product improvement tool: Chaayos also asked their users about areas of improvement. This helped them gain insights into what was not working well and where they should allocate their money to get the highest return on investment. The best example would be when the word ‘cold’ or ‘sweet’ started appearing a bit too often, Chaayos developed and installed electric tea makers, called the Chai Monks, in their cafes to maintain consistency in taste, quality and reduced manual dependence. Their POS became more than a cash register. 51% of users now came back for their second order. That’s a 12.5% uplift in repeat users. A 20-22% hike in overall repeat orders since May. 38-39% conversions from repeat user journey. A 3X boost in purchases from users who have not placed an order in the cafe for the last 30 days. A user nudged by these journeys placed at least 2 more orders within the next 3 weeks. 154% uplift in repurchases from inactive users. Their NPS hovered around 45, which is close to ‘Excellent’. “You don’t earn loyalty in a day. You earn loyalty day-by-day”. 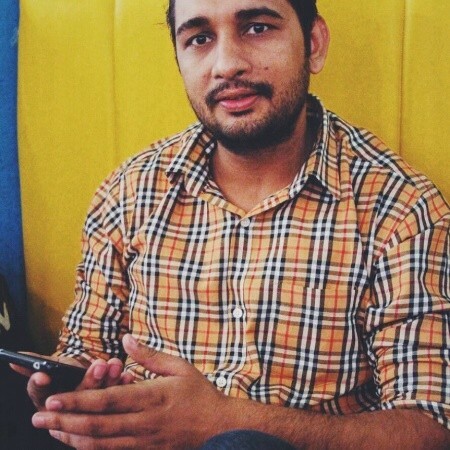 That’s what Chaayos set out to emulate, and has solved their customer retention problem, rather effectively, with the intelligent use of WebEngage’s Journey Designer. WebEngage has greatly improved my team’s ability to understand and unify user data to solve the retention problem. Within 3 months of launching the journeys, we’ve seen a 20-22% uplift in repeat purchases – something we are extremely proud of. The NPS survey gave my team an opportunity to derive actionable insights to deliver the best customer experience. 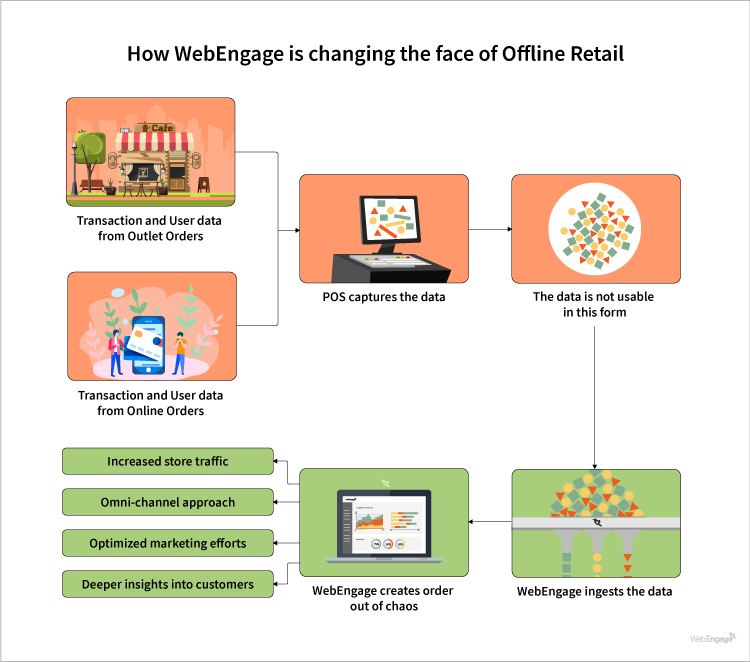 Thanks to WebEngage, we can now be focused on the experience layer that we want to create for our brand.